In November 2015, I spent two weeks in Kabul, Afghanistan, working with DAI’s Women in Economy (WIE) project, funded under the U.S. Agency for International Development (USAID)’s Promote program. One of the WIE’s primary objectives is to help young, educated Afghan women find jobs and move ahead in their careers. My main focus was to explore how WIE could (a) integrate technology tools into their work, and (b) engage with local technology partners. The technology sector, specifically telecommunications, has long been a bright spot in Afghanistan’s struggling post-war economy. During a recent trip I met with representatives from a number of established companies like Roshan (a mobile provider), Arif Azim (a mobile value-added services (VAS) provider), and Jobs.Af (a job portal) to explore the possibilities of partnership. I was not surprised that all of them were excited at the prospect of using their expertise, time, and resources in service of young jobseekers in Afghanistan. But I also noticed the beginnings of an even more encouraging, if more informal, phenomenon: the growth of a tech-for-social-good community in Afghanistan. Founded by a young technologist and social entrepreneur named Jamshid Hashimi, Code Weekend is an initiative that creates and sustains a software developer community in Afghanistan. Afghan organizations such as Digital Citizens Fund are doing great work to put technology in the hands of young women activists and social change agents. But Code Weekend’s mission is in a slightly different category, and in a broader sense, it represents something of a “reverse flow” that’s happening in the ICT-for-development field. That is, instead of development organizations looking for ways to integrate ICT into their projects or amongst their constituents—a great trend in itself—we’re now seeing geeks asking themselves “How can I use my tech skills to solve problems my community is facing?” To me, this is a sign of a maturing tech sector in Afghanistan. 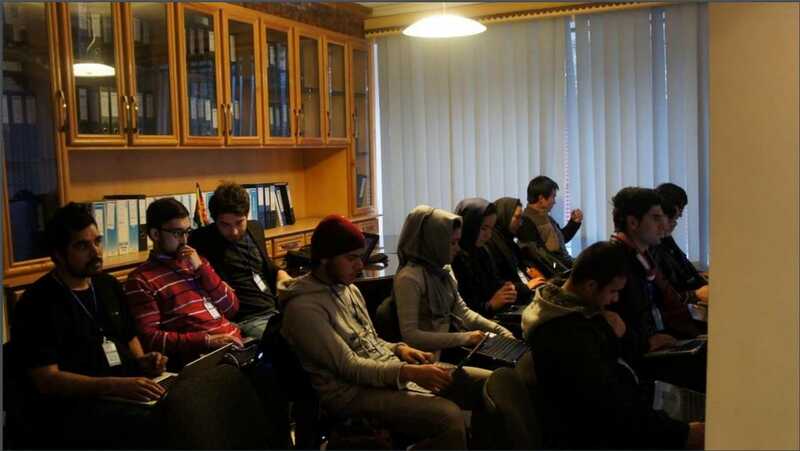 Code Weekend currently reaches about 3,000 young coders in Afghanistan, primarily in Kabul, providing training in various technology skills (web development, app development, languages such as Python, etc.) via ad hoc training sessions. These sessions typically attract between 40 and 100 attendees. Code Weekend also hosts technology podcasts, aggregates technology-related news in Dari and Pashto, and maintains an active social media presence. At the end of November, it hosted its first coding challenge—a month-long collaborative project that will lead to the creation of a mobile phone application to track and counter bribery. Despite the growing energy around its activities, Code Weekend is not without its challenges. It is currently supported by the volunteer efforts of Hashimi, its current president, Asad Salehi, and a core team of volunteer technologists and entrepreneurs. The sessions are hosted at the offices of local companies such as NetLinks, depending on schedules and availability. In essence, Code Weekend has no permanent staff nor facilities. Code Weekend also has trouble attracting female coders to its events and initiatives. Hashimi reports that females typically account for less than 10 percent of training attendees, and, due to cultural factors, they often are hesitant to be active participants in discussions and activities. The number of women tends to increase when events are hosted at universities, since girls have less trouble getting their parents’ permission to attend. I’m not sure if Code Weekend will manage to tackle these challenges and create a lasting impression on Afghanistan’s technology ecosystem, but if it succeeds, it will mark the beginning of an exciting movement. As with similar communities in various developing/conflict-affected countries such as Iraq and Myanmar, Code Weekend has the potential to (a) generate technology tools that have wide social benefits, and (b) create a cadre of young jobseekers who are entering the job market with a range of relevant skills. For WIE, they represent an excellent opportunity to target and nurture the relatively small community of female coders in Afghanistan. Harnessing and nurturing this trend in various developing countries will be one of the main focuses of DAI’s ICT team in 2016 and beyond.